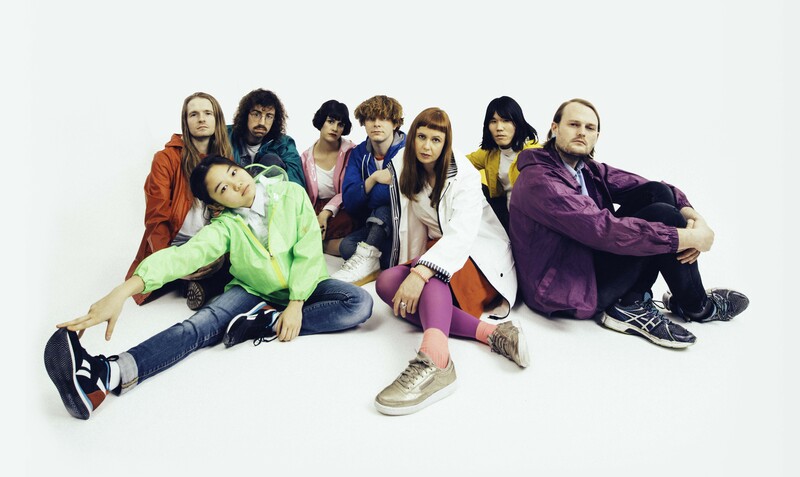 Superorganism’s difference comes from a kind of permanent outsider status. With members from the U.K., Japan, New Zealand, Korea and Australia, they bonded via the internet rather than one geographical location, finding each other on forums while nerding out about music. Their similarities eventually brought them all together IRL, culminating in a mass migration to an unassuming terraced house in East London that they soon turned into an energized creative hub. “It’s like an orphan’s Christmas everyday, we’re people who feel like we don’t belong anywhere, so we tried to belong with each other,” says Emily. Since moving to London, they’ve been on a runaway train of success. 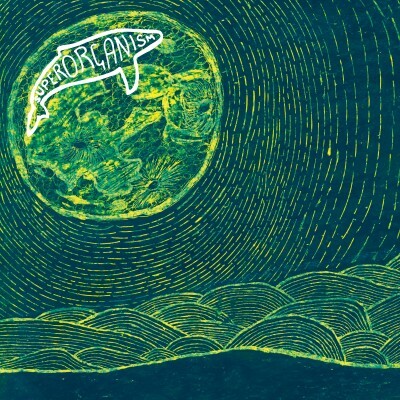 But all the hype around the band: their internet enigma, their co-signs from the likes of Rolling Stone and THE FADER, a performance on Jools Holland, their spectacularly confident, world-building debut album can all be traced back to a one hour window - Superorganism’s Big Bang moment. They’d been living in the East London house, putting together demos for a new, then-unnamed project, when they remembered a teenager called Orono who had been in touch after Youtube recommended she check out the music of their previous indie rock outfit. She had come to their show in Japan, and they ended up hanging out the next day, visiting the Hard Rock cafe and the zoo in Tokyo. Afterwards, they went their separate ways – the band continued on tour, and Orono went back to school - but they’d keep in touch with Orono when she posted one of her lo-fi Weezer or Pavement covers to Soundcloud, or they wanted the best recipe for cold Soba noodles. They thought she could add something new to the mix so they sent the demo over to her. 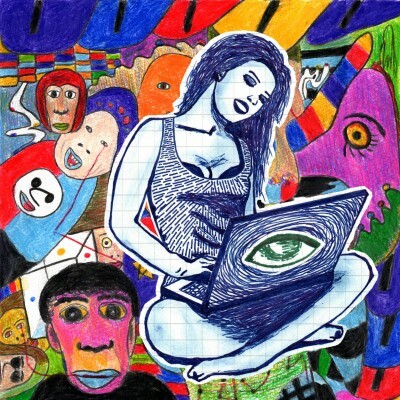 Orono, at the time studying in Maine, New England, started recording some vocals with the microphone on her laptop. “I know you think I'm a sociopath, my lovely prey, I'm a cliché,” she whispered. Within an hour she’d finished her vocals and sent it back to the band. That was their first single, ‘Something For Your M.I.N.D.’. It was loaded up to Soundcloud and then everything swiftly exploded. Within days it had appeared on The FADER, BBC Radio 1 and what felt like every music blog out there. Frank Ocean played it on his Beats 1 show, as did Vampire Weekend’s Ezra Koenig. The band were inundated with messages from new fans all over the world. Initially, they were so freaked out by the interest they decided not to reveal their identities, but that only fueled further interest and speculation, with journalists making wild guesses about who the band might be. Rather than talking to the press they went insular - they set up a shared Spotify playlist where everyone in the band could post influences and musical ideas, and a WhatsApp group where they could post lyrical fragments and memes. From that cloud-based collaboration came the beginnings of the album, and by the time Orono had graduated high school and joined the group in London they were ready to record. What followed was an explosion of creative energy. With everyone in one physical space the album came quickly, with no barriers to collaboration and band members passing audio and video files from room to room in the house. Imagine a squat version of the Brill Building, or a lo-fi, DIY take on Max Martin’s Cheiron Studios, with the band creating absolutely everything: music, artwork, videos, websites and beyond. The final product is something that doesn’t sound much like a debut album: each song is bursting with rich samples and perfectionist production, and you can see why they’ve occasionally been mislabeled a supergroup. “I guess to me, with each song we’re sort of trying to make it sound like modern pop and getting it completely wrong, so it’s full of mistakes and happy accidents and that draws you in.” says Emily. The record has a confident and fully fleshed out world-building depth - voices and ideas that seem bigger than the songs, painting a picture of a present that’s like ours, but not quite the same. They use obscure samples and bits of spoken word with similar crate-digging enthusiasm as The Avalanches. But they are not mere collators, they have a distinctive sound that’s all their own, all squelchy synth puddles and bottle-neck guitar. By the time they revealed their true selves to the world, the demand for a live performance was overwhelming: their first show was a sold out headline slot at London’s Village Underground. Thankfully, they didn’t have to start from scratch in building the stage show: their visual artist Robert lives in the house too, and has been plotting their real-world identity since day one. The results were extraordinary – the world of Superorganism brought to life with hyper visuals and projected 8-bit chaos. The band brought dance routines, outfits and hand-flicks that seemed to come from some fantastical other place - between modems and emotions, the fake and the real. This ragtag group of outsiders had found unity in each other, and performed as a single entity – a Superorganism, indeed.